Disclosure: I am participating in a sponsored Triberr campaign for the NRA and the #KidsLiveWell Program. All views shared are mine and mine alone. One of the things I love about the Internet is how you can follow or participate in events that are happening in another state or part of the world, without having to leave your house, or even take part while on the go using your mobile device. Well, this past Saturday, while enjoying the day with family, I also found time to break away and follow the happenings of the NRA Show 2014, which is taking place at McCormick Place in Chicago, IL, May 17-20th. 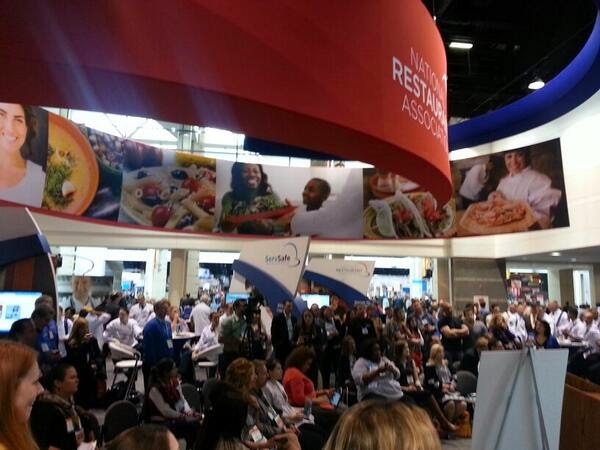 "The National Restaurant Association is a one stop solution for the professionals who represent the restaurant industry as this show will bring in the latest and effective range of equipments and accessories which are needed by the restaurant professionals. This oldest restaurant show has achieved popularity from all over the world and the positive feedback that it received has motivated it to grow to newer heights of success." While I do not work in the restaurant industry, my background is in health education and one topic the folks at the NRA were talking about this past Saturday which I would interested was about their Kids LiveWell Program. The folks at the NRA are partnering with Healthy Dining to offer a Kids LiveWell Program, which will call on restaurants to offer up healthy foods for kids. As a parent who is cautious of what I feed my child, especially when we are dining out, I love the reassurance this new initiative offers in that restaurants also want to offer healthy options for kids, too. Even though the Kids LiveWell initiative is a voluntary program, over 41,000 restaurants have already signed on and are committed to offering healthier children's menu options, for family's dining out. How great is that! 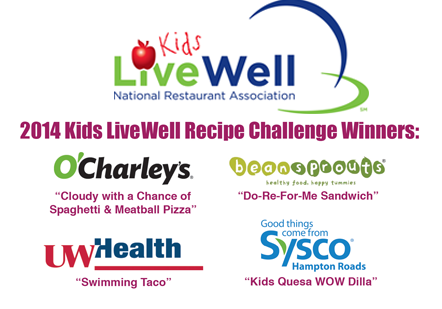 In addition to this wonderful and much needed restaurant initiative, the folks at the National Restaurant Association and McCormick For Chefs created a Kids Recipe Challenge, for participating restaurants & food service providers to enter. 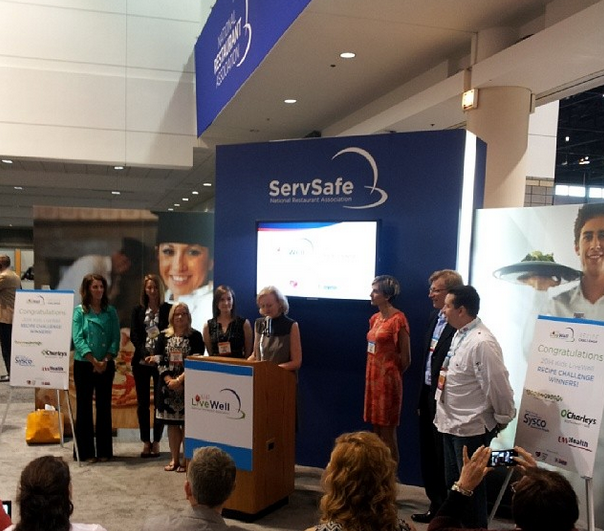 And, during Saturday's scheduled events, the four 2014 Kids LiveWell Recipe Challenge Winners were introduced and given their awards. The Kids Recipe Challenge is a fun and creative way to showcase healthy menu options available when dining out. 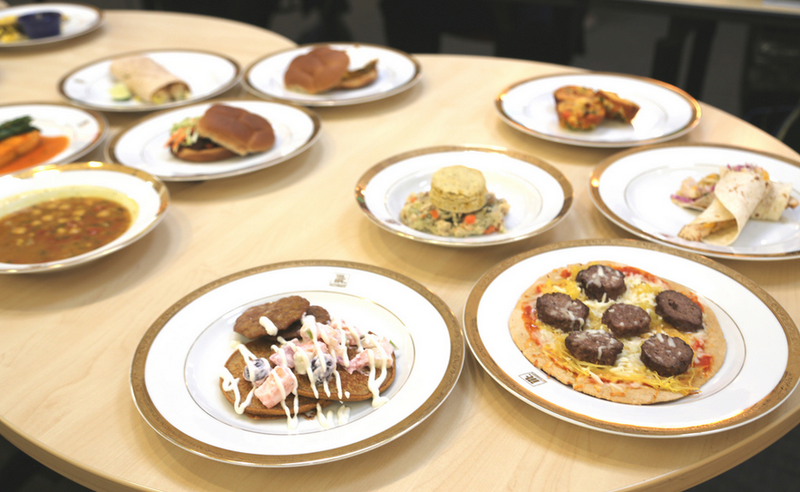 Those who have taking the pledge to offer a more healthier children's menu submitted their creative culinary creations from their kids menus, for consideration and chance to win an award. 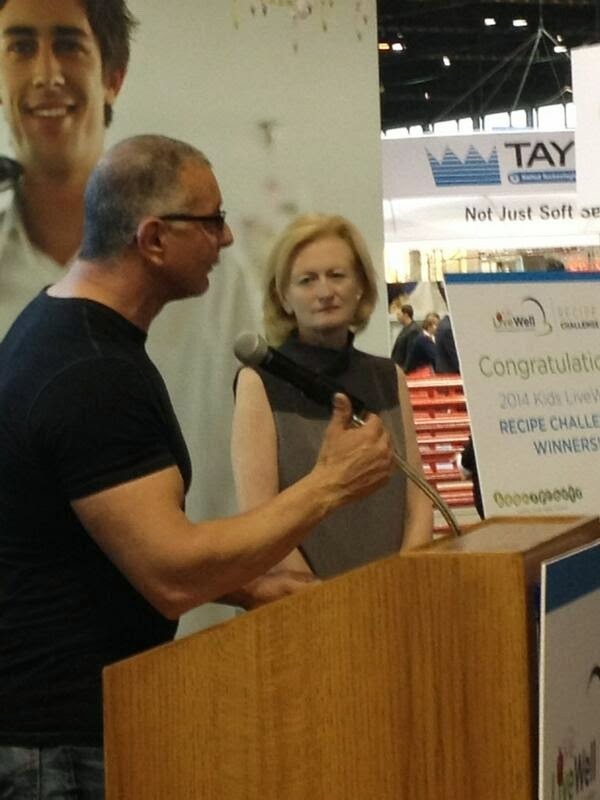 One of my favorite chefs who I enjoy watching on television, as well as creating recipes from his many cookbooks is Chef Robert Irvine. When I heard that he was talking at the NRA Show, I couldn't wait to see photos and hear what attendees thought of his presentation. It was perfect timing, as Chef Robert Irvine took to the stage a few minutes after my girls went down for their afternoon nap. So, I was free to follow attendees on Twitter and hear what they thought of Chef Robert. In addition to the many photos shared of Chef Irvine, many attendees kept tweeting about how he was talking about the importance of healthy meals, and getting kids to be more active. 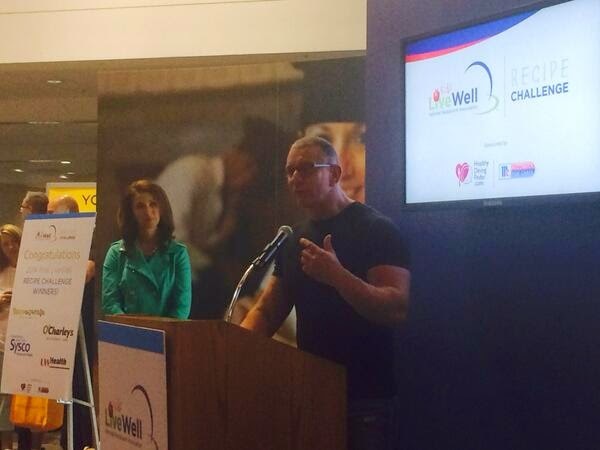 As a health educator, I couldn't agree more with Chef Robert Irvine's thoughts, and am so happy to see the partnership between the NRA and Healthy Dining to offer a Kids LiveWell Program. But, we are a long way from being able to offer our children healthy meals at all restaurant establishments. 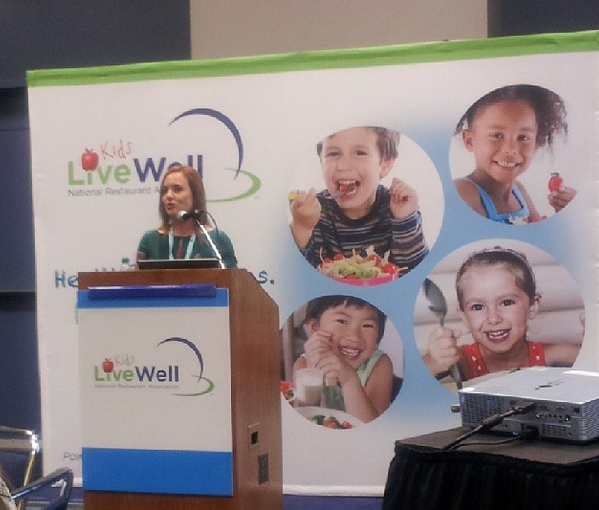 One attendee shared a sobering fact: "There are 42k restaurants participating in #KidsLiveWell - but, there are more than a million restaurants in the US. Here's hoping in the months and years to come that these other restaurants jump on board and take the pledge to offer healthier meal options not only for kids, but for adults, too. I was so glad that while I couldn't attend the NRA Show 2014 in person, that I found time to follow along and hear what attendees thought through this tweets, Facebook posts and Instagram photos shared. I will continue to follow the #KidsLiveWell initiative and hope you will take time to check out the Healthy Dining Finder, and download the FREE Kids LiveWell Mobile app, so that your next dining experience out with the kids can be a healthier one. Below are some great tips for both kids and adults when it comes to dining out, and choosing the best menu items for your family. These and other useful resources and tips can be found at HealthyDiningFinder.com. Call ahead for quick pick-up at many of these nationwide, family-friendly restaurants or take a little time to enjoy a meal together before you hit the ground running again. All of these restaurants offer both Kids LiveWell and Healthy Dining menu choices to make finding the BEST choices at restaurants easy. Search for more restaurants near you serving dietitian-recommended Healthy Dining picks using the mobile-friendly app found at HealthyDiningFinder.com." Ask your server how dishes are prepared – method and ingredients can make all the difference. Find out what comes with your meal – nutrition information posted may not include sides. Choose dishes seasoned with herbs and spices instead of sauces, gravies and dressings. Request sauces, dressings and gravies on the side and use as needed (a little can go a long way). Keep portion sizes in mind – even “healthy” meals can come in extra-large servings. Create your own healthier picks – pair smaller appetizers, side dishes, soups and/or salads. Swap in an extra serving of vegetables for higher calorie sides. Aim to fill half your plate with fruits and vegetables – this is a key MyPlate recommendation. Tame hunger to help prevent over-eating with a pre-dinner salad or broth-based soup. Opt for fresh fruit or sorbet for dessert – less fat and fewer calories, same sweet finish. When enjoying a meal out, it’s not about unhealthy or healthy restaurants. Make the best choices for your diet and lifestyle when you have all the tools and information. Healthy eating at restaurants is even easier when you search for dietitian-recommended Healthy Dining picks on the mobile-friendly HealthyDiningFinder.com, which you can download for FREE." Want to see if there are restaurants in your area that have made this commitment to offering up healthier meal choices for our children? Then, visit HealthyDiningFinder.com to see the growing list of restaurants and their healthy menu items for kids. I'm all for healthier eating and living. I became a stronger advocate of this yesterday when I found out that my uncle is very ill. He is only 47 years old and had to have a by-pass. Aside from that, he has complications with his kidney and lungs. He regrets not watching his weight and not eating healthy when he was younger. I have been on a weight loss journey and have lost over 45 pounds so far. I did it because I want to be a good role model to my daughter. We have since been eating healthy as a family. There's much to be learned and to be discussed about healthy recipes for the kids. Parents should lead the family to start eating healthy food. My kids are grown and gone, but it is about time the restaurant industry caught up with the times. Offering chicken nuggets and hot dogs on every kid menu is very old and outdated. Parents are smarter about their childrens eating habits! If they want more customers then they need to adjust those kids menus to include the healthier choices! Thanks for sharing this. I love this. I am trying to get my daughter to eat healthier because she is a heavy girl and due to physical disabilities, it's hard for her to get enough cardio in. This is awesome. It's nice to be more conscious on our intake of nutrients and calories to ensure we eat healthy. My kids actually eat very good.. They are not the type to just eat grease because its there.. They love vegetables, fruit and salads..
dining out with the family can really be quite tricky but it is good to know that we now have healthier food options for our family. no need to keep eating those fatty fried chicken every single time! So many great tips here, thank you! Good tips! I have food sensitivities to gluten and casein, so I'm always super over the top about asking how things are prepared. Great topic. I know things are changing for the better as far as healthier foods on the menus now. Thanks for sharing. This is awesome - we need more of these in our daily life - being healthy is good. I'm so glad there are more healthy options from which to choose. Kids menus are so hard to work with! Thank you for those great tips. I love seeing more healthier options for my kids when we go out to dinner. It always seems like the same ole thing for them. That must of been a fun conference. My struggle is getting the kids to eat well at home. Too many snacks!! Ugh. Wow! This is a really in depth post! There is a lot of great info here that truly makes you want to watch what you eat! I love the 7 LiveWell menu choices for kids. It's great that these restaurants have become involved in our kids' health.